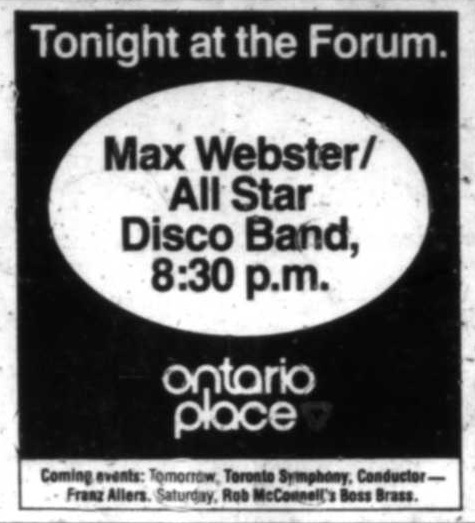 For a very enthusiastic audience, Max perform nearly the entire first album and a couple songs that would end up on their sophomore effort. After years of playing the bar scene, this was undoubtedly a big gig for the band. This night is a rare instance where Kim adds "now ain't there any systems to curb the hiccups and the scratch?" to the end of Here Among The Cats. Mike Tilka says Blowing The Blues Away has just been released as a single. The live version now has an extended ending. Between verses of Toronto Tontos, Kim plays a quick bit of Walk Don't Run by The Ventures.